It felt like the start of summer as the sun came out on Wednesday 20th March and shone for Day 2 of the Allianz Girls’ Wicklow Times Shield, which took place in Bray Emmets. This was the business end of the competition where there were trophies and medals up for grabs in five divisions. If the weather was pleasant, so was the atmosphere where all games were played in great spirit. In Division 1 St Laurence’s prevailed once more to retain the shield. Ashford were the winners of Division 2 with Newtownmountkennedy grabbing top spot in Division 3. St Brigid’s won Division 4 and Roundwood 2 prevailed to take the Division 5 crown. A huge thank you to Garrett Doyle who set up and coordinated the event. Thank you to Bray Emmets for the use of their facilities and to all our referees and teachers. Finally thank you to the girls themselves who played some lovely football and gave their all for their respective schools. Schools participating on the day were Scoil Chualann Bré Chualann, St Laurence’s Greystones, Gaelscoil Chill Mhantáin, Gaelscoil Uí Chéadaigh Bré Chualann, Scoil na Coróine Mhuire Ashford, Kilcoole Primary School, Wicklow Educate Together, Greystones Educate Together, Newtownmountkenneddy Primary School, Kilmacanogue National School, Moneystown National School, Roundwood National School, St Kevin’s National School Greystones and St Brigid’s National School Greystones. 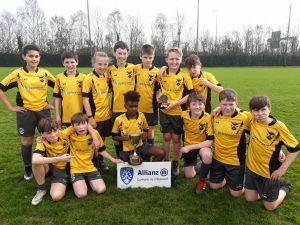 The Allianz sponsored Cumann na mBunscol Coughlan Cup Finals for 2019 didn’t start out as planned as the winds on Wed 13th March caused a cancellation of the finals for divisions 1, 2 & 3. Luckily the weather had abated somewhat on Thursday 14th for divisions 4, 5 & 6 to get the green light. Having been graded from Day 1 these very competitive divisions saw some great teamwork, especially playing against the wind, competitive team spirit and closely fought games to complete a very satisfactory day for the organisers. 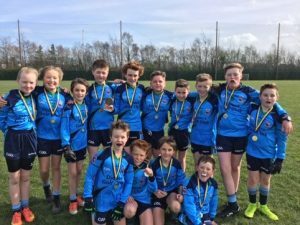 Topping the group and winning the trophy in Division 4 were Gaelscoil Chill Mhantáin. Winning two very tense games versus Newtown Primary & St.Brigid’s, Greystones, this cohesive unit, under the tutelage of Múinteor Aaron, were deserved winners on the day. After Day 1 division 5 turned into a two horse race with Moneystown NS, Roundwood & Gaelscoil Uí Cheadaigh, Bré leading the way. 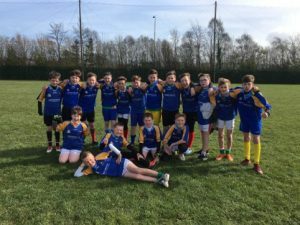 Having lost to Gaelscoil Uí Cheadaigh the first day out Moneystown NS looked to overturn the result and that they did in another very close game where every unforced error was punished by the opposition. A brave Kilmac performance in the last game of the day wasn’t enough to deny Moneystown NS the title of division 5 champions. 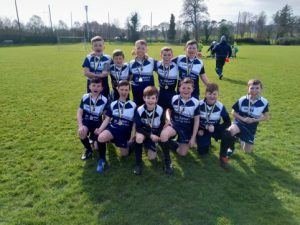 Division 6 saw a very brave and determined St. Peter’s, Bray team come out on top. 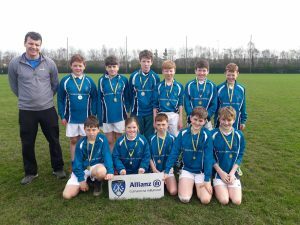 A team with raw talent and coached well by Paddy Mullen overcame a strong Wicklow Educate Together side, who finished as runners up, and a skilful Kilmacanogue’s second team. Divisions 1, 2 & 3 finally got their day out after the initial cancellation due to an orange wind warning the previous week. Division 1 saw two semi finals of St. Laurence O’Toole NS, Roundwood vs St. Cronan’s 1 Bray and St. Kevin’s Greystones vs St. Laurence’s 1 Greystones fight it out to see who would contest the final and become Div. 1 Coughlan Cup champions for 2019. Having dominated early on Roundwod NS let their lead slip nearing the end of the game allowing St. Cronan’s finish the stronger and progress to the final. In the other semi final, the ‘Battle of Greystones’ was comprehensively won by St. Laurence’s. Their teacher, Mr. Conlon, was particularly happy that they fulfilled their potential, showing their extensive skills set and good cohesive play. In the Div. 1 final St. Laurence’s Greystones again continued where they left off in their semi-final and worked well together to beat a very accomplished St. Cronan’s Bray team. There was delight all round the St. Laurence’s camp as all their hard work reaped the rewards again this year. Division 2 was grouped into two round robin groups. Group ‘A’ consisted of Greystones Educate Together 1, St. Patrick’s Wicklow Town & Scoil na Coroine Mhuire Ashford and Group ‘B’ was comprised of St. Coen’s Rathnew, St. Laurence’s 2 Greystones & Kilcoole Primary. Kilcoole Primary, battled their way through Group ‘B’ to reach the final, showing that their award winning behind the scenes Cumann na mBunscol work doesn’t detract from their on field displays. As Kilcoole were topping Group ‘B’, quietly progressing through Group ‘A’ to top the group were Cónán Daye’s Scoil na Coroine Mhuire Ashford, overcoming some strong opposition in Greystones ET & St. Pat’s. The Div. 2 final was a much closer affair as both evenly matched teams battled it out to take the inaugural Jim O’Riordan Cup (Corn Uí Riordáin). As the lead changed hands throughout the game it was Scoil na Coroine Mhuire who finally came out on top with a two point win. 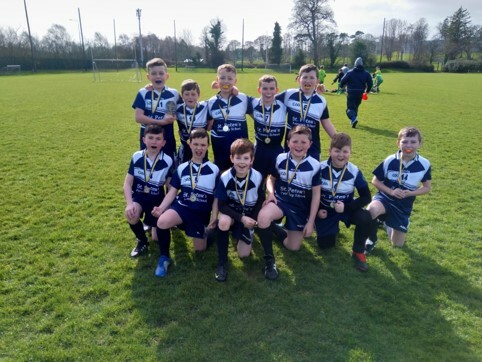 Division 3 saw Scoil na Coroine Mhuire’s 2nd team beat St. Patrick’s Wicklow Town’s 2nd team in the final which saw another keenly contested group stage and a high quality of skill on show. Division 3 consisted of second teams from Ashford, St. Pat’s, Roundwood, St. Cronan’s, Greystones ET and St. Laurence’s Greystones 3rd team. 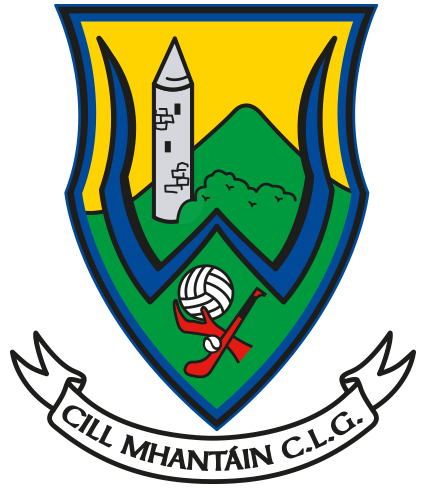 Allianz Cumann na mBunscol Chill Mhantáin would like to sincerely thank Liam McGraynor and Bray Emmets for very generously making Emmet Park available to the schools of the North East.  We’d also like to thanks Dave Barry & Micheál Ó Murchú for their continued support & coordination of tournaments. A big thank you also to Garrett Doyle, our Wicklow GDA, who oversees each tournament, organising referees and has these blitzes organised to the highest standard. Next up for Allianz Cumann na mBunscol is our Skills Test Day in regional locations around the county. Best of luck to all the children taking part! born on or after January 1st 2007. Each pupil will only be permitted to compete in one code. The top 2 pupils in each code from each area will be invited to compete in the County Skill Tests scheduled for April 3rd in Wicklow GAA Centre of Excellence, Ballinakill at 11am. The top performing pupils in the County Skills tests will have the opportunity to represent their school and county during the half-time of selected All Ireland Series games during the summer, which is a wonderful opportunity. All schools have been emailed the football and hurling/camogie skills tests with the 2019 Skills Challenge Enrolment Form, which must be brought along on the day. It is encouraged that each school host their own internal tests to aid selection of their representatives before forwarding them to the regional skill tests. The North-East test will take place on Wednesday March 27th in Bray Emmets, Boys/Girls Football at 11 a.m. and Hurling/Camogie at 12.15 p.m. Dates and venues for the South and West regions will be confirmed as soon as possible but the competition is due to take place on the week beginning March 25th. Please pay attention to the rules and date of birth outlined as they are very specific and must be adhered to. If a child has represented Wicklow in Croke Park previously in any code they cannot take part at any level of the skills test again e.g. regional skills day etc. Please be advised for those participating in the upcoming INTO Skills Tests that there are new skill tests for Gaelic football, while hurling remains the same. Any school wishing to participate in the skills competition and other Cumann na mBunscol activites MUST have registered with Allianz Cumann na mBunscol Chill Mhantáin. 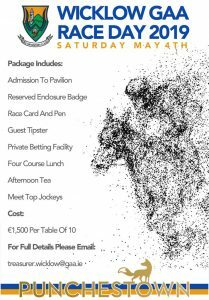 To register please send the attached Registration form and €50 cheque/cash to our Cisteoir, Emer Fahy, St. Anthony’s Building, Kilcoole Primary School, Kilcoole, Co.Wicklow.